In our 41st edition of the Donut Dollie Detail, Nancy tells how a “Dust Off” crew flew her and another Donut Dollie (dressed as Santas) to visit the men on Christmas trailing red and green smoke, that her quarters in An Khe were blown up during a visit by 5 of the World Series winning Mets (an unforgettable experience for all) and how seeing the “boys” blown apart was one of the most disturbing things she experienced while in Vietnam. Please share the Donut Dollie Detail with family, friends and veterans you may know, and make sure to like/follow us on Facebook to learn when the next edition is posted. 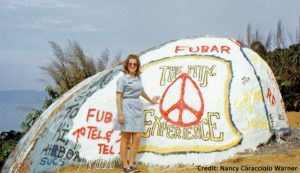 What prompted you to join the SRAO (Supplemental Recreation Activities Overseas) program and want to go to Vietnam? I was in grad school, and bored! I wanted to work internationally and was hoping to parlay my History degree and fluent Spanish into a Foreign Service job. I applied to the CIA and State Department, and they were happy to interview me and offer me a job… as a secretary… it was 1969, after all. Not for me! I met a school teacher who had been a Donut Dollie in Korea, and she told me, and my best friend, all about the job. We applied that week!!! We both went to Vietnam in July, 1969! 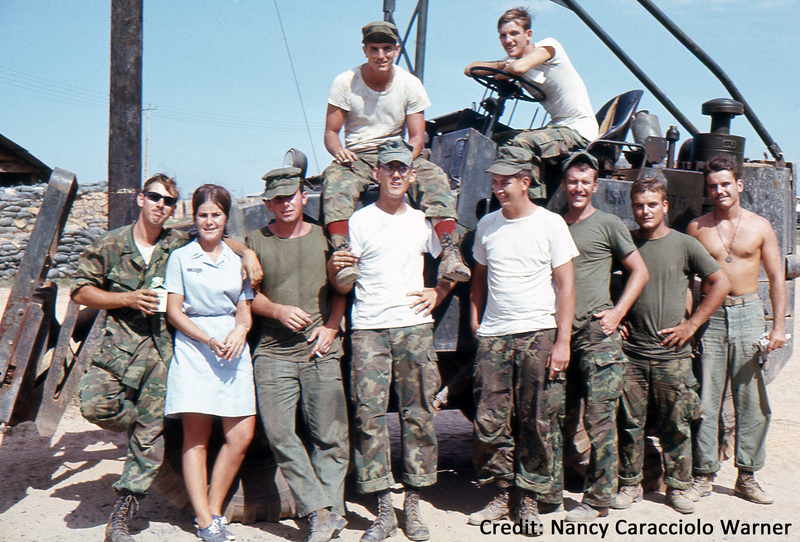 When and where were you stationed in Vietnam? Did you go by a nickname? 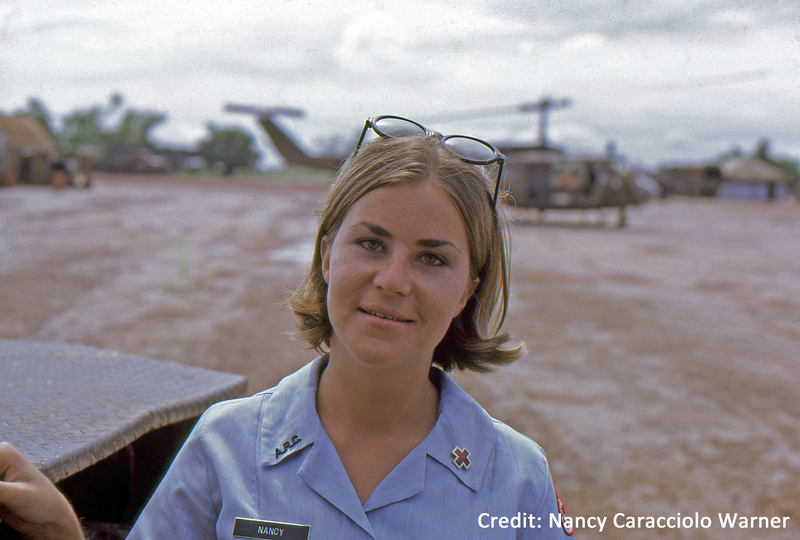 I served in Vietnam from July, 1969 – August, 1970 and was in Lai Khe for my first placement with a two week TDY (temporary duty) to Phuc Vinh, then I was promoted to Program Director and went up to An Khe in the Central Highlands. 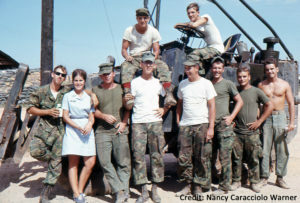 My last 7 months (I was asked to extend my tour a month) was as Unit Director in Da Nang. 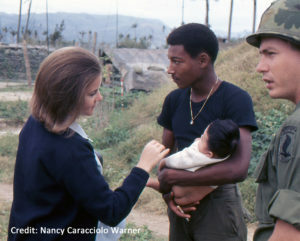 I was known as Nancy in Vietnam. What was a routine day like in Vietnam? If it was a clubmobile day, you were up early and out looking for rides to wherever you were supposed to go… a firebase, another outpost off the base or someplace where there was a unit doing work with civilians. A helicopter, plane, deuce and a half, or whatever we could scrounge to get us there, if there was not a prearranged mode of transportation. We would arrive at the location and scout around for the First Sgt. or Company Commander to arrange a gathering of the guys for an hour of programming. Depending on what might be going on at the base at the moment, you might have to be really flexible and redirect your efforts to see as many guys as possible. Maybe they had had a bad time in the field and they were not feeling it for a program. We might stand behind the lunch line and serve them their hot meal or we might go to them in smaller groups and see if there was a game to play or just visit. Afterwards, we’d get the First Sgt. or CO to get us a ride out to the next stop and do it all over again in a new location. We might get to 3-5 stops in a day, if rides came through. We would get home before dark, write up statistics and a report of how the day went, shower and get ready to head out to whatever unit party was scheduled for that evening. It was part of our job to be the “girls” at parties and we would socialize with guys at their stand downs. Repeat again the next day. If we had a recreation center, you might be in there for the day programming, playing cards, pool, pingpong or whatever to interact with the guys. Also, lots of planning would be taking place in the center for the next holiday decorations, events and so on. Long days, always “on” and always smiling, welcoming and friendly. Did you ever have any “close calls” either on base or in any vehicles? When I was in An Khe, our quarters were blown up by sappers when the Unit Director and I were inside (the term “sappers” was used to described Vietnamese – probably local Viet Cong – who were skilled at demolition or firing crude rockets). We both dove under a bed and pulled the mattress down to shield ourselves. Two helicopter pilots managed to come in checking for anyone still inside and pulled us out. The quarters were destroyed enough that we all had to live in one of the hospital wards for a month while it was repaired. Incoming fire was a fact of life in most cases and we often spent the night in a bunker rather than in our beds. 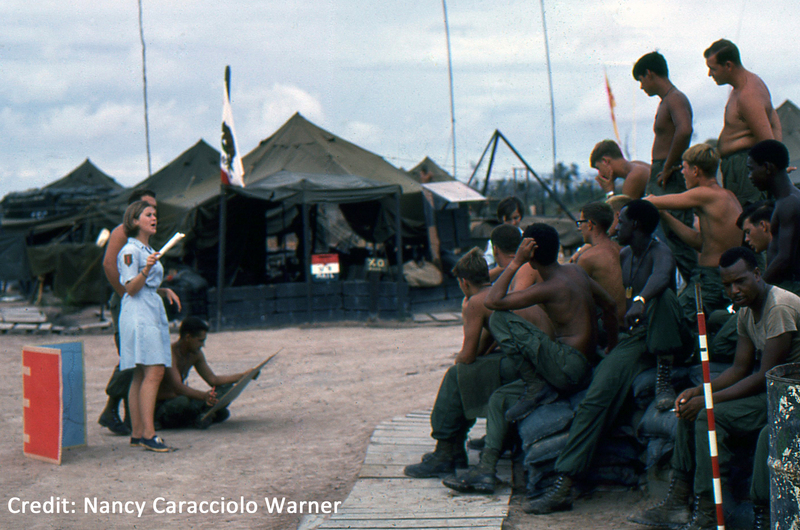 Were you ever injured while in Vietnam? What was it like to visit the soldiers in the hospitals? Seeing those boys blown apart was probably the most disturbing thing about the year in Vietnam. My first reality check was with a PFC (Private First Class) I had met and befriended on a firebase outside of Lai Khe. I had only been in Vietnam for three weeks. He was a Brown graduate and an All-American hockey player. All he wanted to do when he got out was to go home, teach school and coach hockey. The next time I saw him he was in the MASH unit having lost a leg, plus serious injuries to the other leg, with amputation still a possibility, serious injuries to his arm and loss of hearing. I was destroyed and actually thought about going home. I couldn’t imagine that this was what I would be experiencing for the next year on a weekly basis. This is where you realize you have to shut some of your emotions down in order to survive it all. You walk this fine line of being sincere and interested, but then you are not allowing all the details of their lives to get to you, so that you are invested in them in a way that will cripple you should something happen. It was totally a survival reaction and happened almost without effort. How was the transition returning home to the United States? I grew up in a military family and my family was stationed in Spain while I was in Vietnam and when I went home, that is where I went. I stayed in Europe, traveling on a Eurail pass for a year. I would go home to Madrid for a break once in a while during that year, but I didn’t come back to the US until the year following my year in Vietnam. It did help cushion my adjustment. What would you like people to remember and understand most about the women who served? The women who served were women who stepped out of their comfort zone and were willing to accept the risk of this year with open hearts and minds. Not all of us understood what that meant or would mean. Most rose to the occasion and well represented American women to the men who served. It was very hard work. We were away from all of our support systems and had to dig deep many times to be strong and to deal with the variety of things that came up. We all did it in our own ways and yet, we all did it well. I am so proud to be numbered among these women. How do you feel Veterans think of your time having served with them? Have any Veterans expressed their feelings to you directly? I have, only once, had any negative reaction to women having served in Vietnam. All these years later, they hug us, thank us, say kind things about and to us, and remember our service fondly and, surprisingly, put it on the same level of importance as their own service. We loved them then and we love them now. 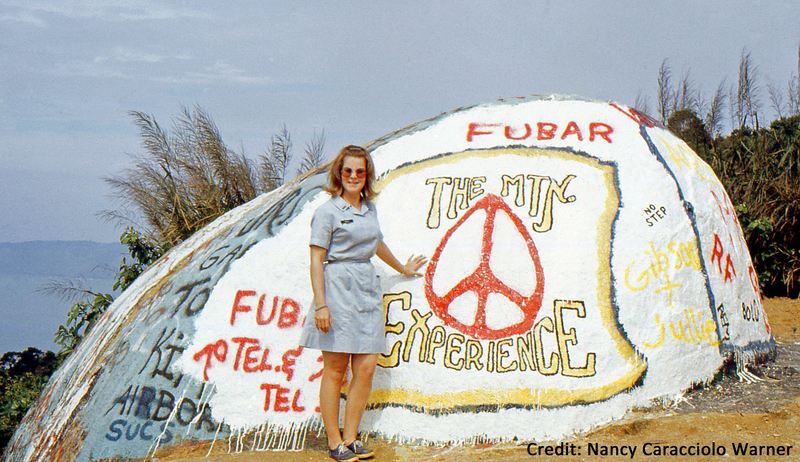 What are your fondest or most interesting memories of your time serving in Vietnam? I remember the Dust Off crew who, on their own time, took two of us out to many of the firebases and outposts outside of An Khe on Christmas Day. We dressed as Santas and they flew us… with red and green smoke trailing, to see the guys. It was the best Christmas ever! I remember the night our quarters were blown up, when 5 of the World Series winning Mets were visiting in An Khe. Since the hospital was under attack, we were all helping the medical staff move the wounded into the hospital bunkers. All 5 of the Mets pitched in. Terror in their eyes, but without hesitation, they helped us lift and carry out stretchers and hung IVs on the bunker racks. We all collapsed on the floor of the bunker when we were finished and they did themselves proud!!! I loved doing a Radio Show, both in Lai Khe and Da Nang. We did song requests for the guys. It was so gratifying to be out in the field and hear how much that show meant to them. Some requested songs they taped to send home to their girlfriends or wives from their requests on the show. It was so nice for them, and for us to hear how much they loved it. Our elderly Papasan in Da Nang asked for some time off to rebuild his house that had fallen apart in the monsoon rains. I went to the civilian worker management office (not sure what it was called officially) and told them that we were going to let him have two weeks paid vacation. The Sgt. went off on me about how we only pay them for when they work. I disagreed and argued that most Americans get paid vacation time of at least a week, and that Papasan had been working for the Red Cross for many years and deserved two weeks. I stood my ground with him, as well as some Major he sent me to see. I insisted that we treat our employees as we would want to be treated. I guess I shamed them into permitting it, as Papasan was overjoyed and later invited me to come to “dinner” at his new home!!! I feel like we Donut Dollies will be like the WASP’s of WWII. No one will know of our service until most of us are gone or are less able to talk about it!! Interestingly enough, though many of us are capable of telling our story on our own, I think we are just too humble about it and think it insignificant, as compared to what the men who served were doing. I have always felt that their sacrifice and the circumstances under which they served, deserved all the recognition and honor. Sadly, even they did not receive that when they came home. So, better late than never!!! Thank you for your Service and Welcome Home! It is never too late to be recognized and what a selfless act of love and patriotism shown by Nancy and the rest of these wonderful women! The Dollies were a wonderful distraction from the alternate terror and boredom that existed in Vietnam. The women provided warmth and humor that I looked forward to when possible. They even became lifelong friends. A big hearty thanks to the Donut Dollies and especially Nancy Caracciolo Warner who I am honored to call my friend. 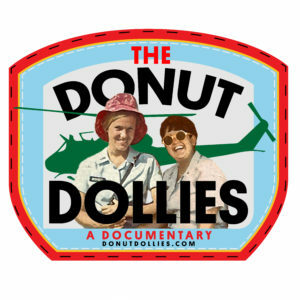 Until I met Nancy I had never heard of the Donut Dollies and their dedication to lift the spirits of our servicemen despite the danger and sacrifice to themselves. We need to spread the word of their heroism. Thank you for your service and welcome home Nancy.. I thought you were my girlfriend at that time, what are you doing with all those men.? My Christmas Day in 1969 was spent with Nancy. My best Christmas Day ever! Nancy, thank you for your service. Thanks for being there for us. You can’t imagine how much it meant to us. All you DOLLIES were a Godsend. THANK YOU THANK YOU THANK YOU!!!!!!!!!!!!!!!! Thank you for doing an excellent and much appreciated job. I know how important you women were, I was there 67′ 7 68′. Nancy is my older sister and may I say that I’m extremely blessed to have her in my family. She is one of a kind and an inspiration of love, courage and service to all she comes in contact with. I never saw any of you in Vietnam. I was at Camp Holloway Pleiku then Marble Mtn and Da Nang from oct 1971-Oct 1972. I’m glad though that you brought a touch of home if only for an hour here and there. Welcome home. Nancy, you have always been a hero in my book! The DD’s were a special group of women that did bring cheer and hope to us grunts. I will always remember them and how they made me look for the best in a bad situation. Thank you. Nancy is a friend of mine. We were in high school together. What an honorable selfless act for her to sign up for this. Thank you Nancy. I’m so proud of you. Great to read further details regarding my sister’s committment to her service with the Red Cross. She has always been an example of persistence and perserverance in any given situation. Her heart of compassion and courage defines who we as a family have always know her to be! Thankful that others could be touched as well!! I always looked up to my cousin Nancy. Her contribution to the Vietnam War was huge at the time and she did it selflessly . She is an amazing person and I was and still am so proud of her. Hey Nancy, I was one of the 2 helicopter pilots that pulled you out of the hooch in An Khe! Love to get in. touch….have some photos of when I dated Judy Probert taken in your quarters on Hong Kong Mountain. The other guy was Gary Stevens “Learch” We were both CW-2’s with the 119th AHC Alligators ’69-’70. I’m thrilled to know your story. Had no idea. You are truly a beautiful heroine.! Thank you, Pat! The men who served were the heroes! Ignite Plus WordPress Theme by Compete Themes.